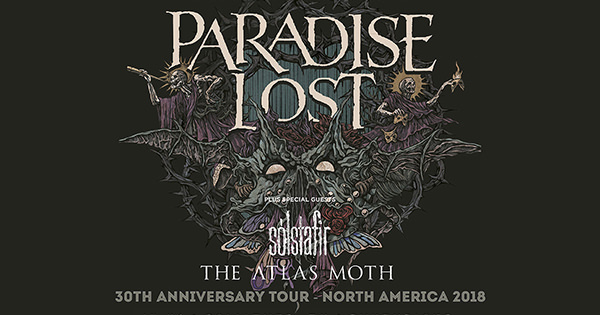 Gothic doom-death legends Paradise Lost, will return to North America after a six year absence for a headlining tour in support of their latest album, Medusa. Joining them will be Solstafir and The Atlas Moth. Dates can be found below. Commented Paradise Lost vocalist Nick Holmes: "The last time we toured in the USA, was in 2012 on the 'The Epic Kings and Idols' tour with Devin Townsend. Six years, and a couple of albums later, we are really pleased to announce that we will finally be heading back to the States for our very own coast to coast headline tour. It's our 30th anniversary tour, and we will be playing a selection of our best songs from over the years. Looking forward to seeing you all there!"